This fresh salad salad is a staple around here! I make a big batch and have lunch all week! I used my easy to make Dijon and Lemon Vinaigrette recipe. Swapped out the apple cider vinegar for balsamic and added a half cup strawberries. Boom, instant Strawberry Vinaigrette! There are so many ways to switch up this salad with whatever you have on hand. I make it with diced apple a lot of the times as I always seem to have apples around here. Switch up your nuts. Ya I said it. Switch…up…your…nuts. Just do it. Walnuts, Macadamias, whatever you love in a nut, toss it in there! (a few more !!!! for your nuts!). 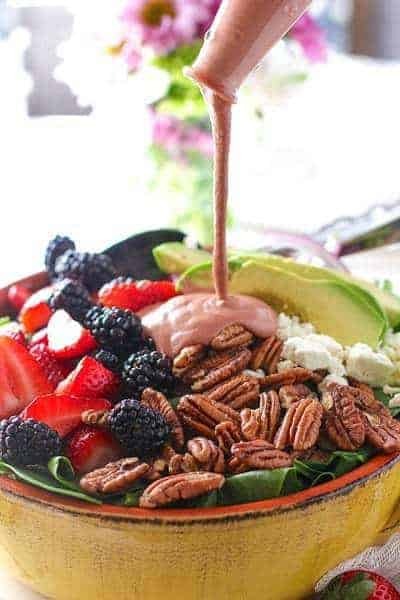 You could easily add grilled chicken or shrimp to this Fresh Spinach Berry and Pecan Salad! for a protein and make it a meal…and of course some bread. Bread is always good with salad. And butta, bread and butta. There goes my healthy salad. Oh and wine, you gotta have wine with this right? I’d pair it with a nice crisp Sauvignon Blanc or even one of those summery dry Rose’ out there right now. Totally into those lately! A few more !! 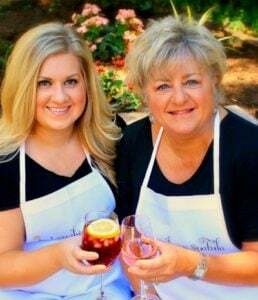 for the wine!! This would be fabulous served with Feta and Herb Crusted Salmon. You would already have the feta left over from the salad. How convenient is that? Or Baked Parmesan and Dijon Crusted Chicken would go great with this salad as well! Spring is in the air and summer is around the corner! A fresh and easy salad that can be made a hundred different ways! Add spinach to large bowl. Add all ingredients to blender and blend for about 20 seconds or until smooth. Toss salad before serving or serve dressing on the side. 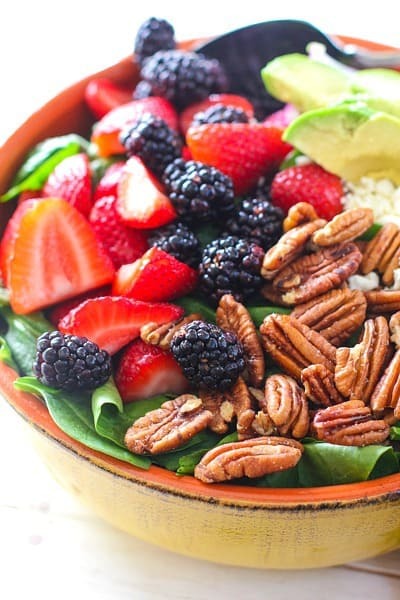 Spinach, pecans, and blackberries…Oh My! Then you go and add avocado and Strawberry Balsamic…I am all in! This looks absolutely amazing, can’t wait to try it. Pinned! Thanks Susan! Hope you get a chance to try it! 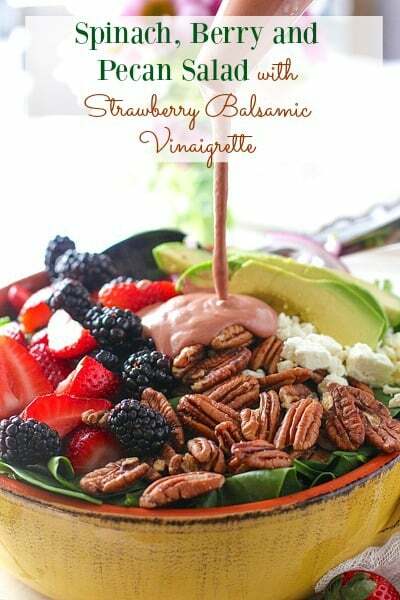 This looks fantastic, I love to make salads a little more interesting and that balsamic sounds incredible. The balsamic was really good – kinda surprisingly good! Thanks for the nice note! Ummm, this salad is making me hungry even though I just ate dinner!!! Well thats a pretty good compliment! Thanks for the note! I could eat this every.single.day this spring and summer! Thanks Gwen! Hope you get a chance to try it! I am obsessed with balsamic and berries, especially getting into spring right now. This looks amazing! Thanks for the note Kim! I love a good salad, but when you pair my favorite things together I am in heaven. 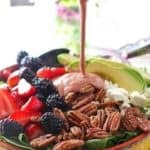 I love spinach berries and pecans. I can’t wait to make the dressing!